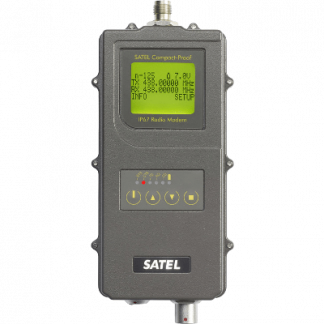 SATEL Compact-Proof is an IP67 classified UHF radio modem for wireless data transfer. It has a 1 W transmitter, wide 90/70 MHz tuning range (330 to 420 and 403 to 473 MHz models) and selectable channel spacing. 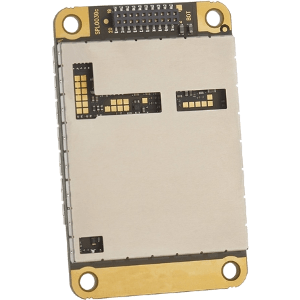 It is based on SATELLINE-EASy and provides a compact and flexible solution for a wide range of applications. It is particularly well suited for outdoor use (land surveying, for instance) under varying weather conditions. SATEL Compact-Proof has a rechargeable and replaceable battery. The lithium-ion battery provides a longlasting performance and plenty of operating hours. The operating time in +25°C is more than 15 h ( 50% duty cycle@1 W). Fully equipped with a Liquid Crystal Display (LCD) and a keypad, settings of the Compact-Proof can be changed in an instant without any additional hardware and the easy to read display provides current received signal strength (RSSI), channel/ frequency and power supply voltage to monitor battery or solar power levels. 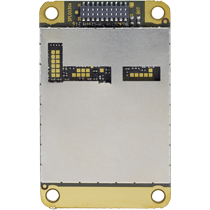 Set apart from similar products by our proprietary board design, and specialized industrial class superheterodyne receiver; SATEL’s exclusive SATELLINE technology enables dependable UHF communication in extreme conditions when similar products fail. 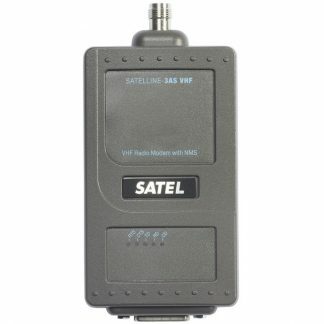 Capable of communicating even in environments with sporadic 12 dB weaker interference on the exact same frequency, SATELLINE UHF radio modems have adjustable signal threshold to focus only on selected stronger signals enhancing operation in densely populated areas and regions with excessive ambient radio frequency noise. 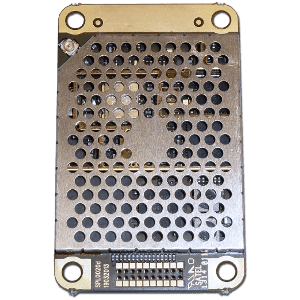 Encapsulating device data packets network wide with self-correcting algorithmic data, FEC, gives SATELLINE radio modems the internal tools to actually eliminate erroneous bits and reconstruct the original data packet when there are slight errors from long distances or heavy interference. When data quality is essential, SATELLINE radio modems come with SATEL’s proprietary Error Check and full CRC16 error checking which can be set to either completely reject any data packet with errors transparently, or pass the packet and checksum intact to a device master. 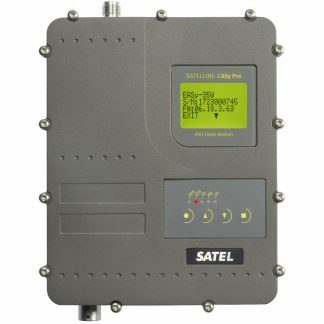 Continuing to research ways to reduce and eliminate difficulties that plague many wireless installations, SATEL’s exclusive Free Channel Scan (FCS) feature is a powerful multipurpose tool for shared channels, frequency pools, mobile and temporary networks, or to add versatility to one-way transmission between a transmitter and one or more receivers when there are multiple frequencies available. In two-way data networks sharing a set of frequencies or in mobile applications when a clear channel must be established before use, a channel list is entered into the free FCS graphic interface software turning SATELLINE radio modems into a simplified spectrum analyzer monitoring and displaying the noise level for each frequency allowing the user to select the optimum channel. In one-way data transmission networks, FCS automates the use SATELLINE modems. While transmitting, the base station and repeater radios automatically listen for channel disturbances, change to, and transmit on the best available frequency; while synchronized remote receivers scan all available channels for a base station transmission beacon anytime a connection is lost because of interruptions on shared channels, movement of other users in a frequency pool, or to move from one data transmitter to another. FCS software and the User Guide are available for free download. There are 6 clearly marked and intuitively colored LEDs that show the current status of the SATELLINE modem. There are indicators for the data modem sending and receiving to the device; radio transmitter and receiver activities; and radio frequency channel status- including if it is in use by an unknown party. An additional indicator shows battery status. Crowning SATELLINE advanced technology is the built-in backlit LCD display that provides users with vital diagnostic information about received signal strength, frequency, power supply and data settings at a glance. Durable pushbuttons give instant access to virtually all of the radio settings through easy to read menu selections. SATELLINE “D” display models allow for setting up, using, configuration changes, and testing to all be done without ever using a laptop, PC or any other device. Mechanically switched into programming mode by grounding the “Programming-Pin”, all of the radio settings are accessible using any terminal software. Self-guiding menus clearly display settings and selectable options in plain English. 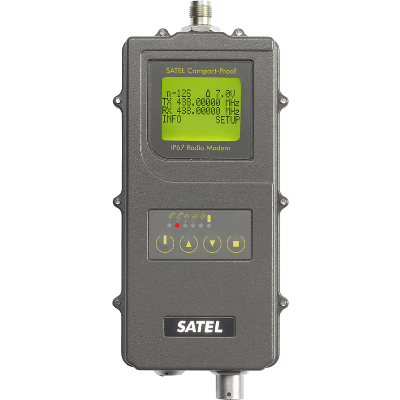 SATEL’s SaTerm software simplifies advanced configuration by providing an additional graphic interface for some of the more complex aspects like message routing, creating settings profiles, and updating firmware. Eliminating complicated external synchronizing signals by using asynchronous data streams, the entire data stream is transmitted less than 1 millisecond after it is received arriving at the other end intact and without interruption or re-packetizing and allowing for the highest level of transparency to connected devices. Cutting down on installation and repair times, SATELLINE radio modems feature short and long block testing to simplify antenna testing and alignment, link, system and path tests. When combined with the benefits of conveniently displayed signal strength on the receiving modem, antenna installation times are reduced to a minimum. All SATEL radio modems are capable of store-and-forward repeater functions or may be paired together for duplex repeater operation. Repeater functionality allows for virtually endless connection range and network coverage. Message routing and addressing functions can be added to create robust and far-reaching network topologies. Configurable with dual transmission and receive addressing and network identification, SATELLINE radio modems can remain transparent and universally compatible with devices while still extending networks across longer distances through one or more repeaters or to isolate multiple sub-networks without receiving duplicated or conflicting device data. By identifying source and destination addresses for data in many pre-configured or user defined polling data protocols, SATELLINE radio modems automatically direct data packets to their destination by finding the route within the radio network itself transparently to connected devices. Routes are automatically created if a remote location is moved, a repeater station is lost, or in systems with mobile remote devices. The AMR function is configured using SATEL’s free SaTerm PC software. SaTerm allows users to able to graphically design a radio modem network, troubleshoot, and make radio modem firmware updates by simply drawing connections between radio modems, while routing information is automatically generated. Advanced control and diagnostics are available from all SATEL radio modems using SATEL Language (SL) Commands. Experienced users and manufacturers with integrated SATEL solutions can utilize “SL-Command” blocks to interact directly with all SATELLINE radio modems. Capable of operating on as little as 3-wire (Tx, Rx, & ground) communication or as much as 25-pin rs-232 with full hardware handshaking.